TRANSPORTING over 100 tonnes of steel and more than 2,500 bolts up the highest mountain in England and Wales was never going to be an easy feat and was made a lot more difficult by freak rainfall! With STRUMIS to deliver the detailing and project management tools needed and with sheer determination from the EvadX team, this complex project was facilitated and rapidly concluded within both time and budget. 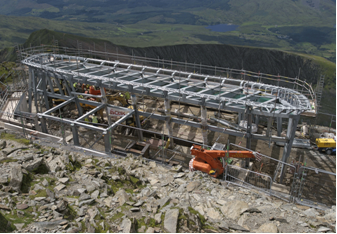 EvadX were proud to have been chosen as the main steelwork contractor for the new Summit Building on Mount Snowdon. Andrew Roberts, Drawing Office Manager at EvadX was the project manager behind the development of this £9 million visitor center. Andrew confirmed that even more so than usual, the collaboration between Engineer, Architect and Main Contractor Carillion, became vital to the success of the project. STRUMIS played a vital role in this project management workflow and are integral to operations at EvadX. Andrew states he was proud to have worked on the centre and said: "you only get to work on maybe one of these in your lifetime - at around 3,560ft tall it must be one of the highest projects in the UK"
Modelled and detailed in bimrEVIEW, each phase of the project was subsequently fabricated by EvadX with the aid of STRUMIS. Material stock, procurement and all unique project requirements are simultaneously controlled by the STRUMIS system - with all projects monitored and fabricated using specific EvadX fabrication routing and benefiting from best practice work flow delivered by the system. With functionality from estimating through contract and budget control during fabrication, combined with visual production tracking and scheduling, STRUMIS provided all members of the project with vital up to date information. The STRUMIS system ensured that the project progressed accurately and with maximum efficiency, which was vital given that the project was due for completion in this extreme location.